DAYTON — The Dayton Art Institute offers a look back at the World Wars this summer, with the special exhibitions, “Call to Duty: World War Posters” and “Tears of Stone: World War I Remembered, Photographs by Jane Alden Stevens,” on view at the museum through Oct. 4. “Call to Duty” features more than 80 original war posters from World War I and World War II, by such greats of American illustration as Howard Chandler Christy, James Montgomery Flagg and Norman Rockwell. The posters help tell the story of the massive human efforts put forth during these 20th-century global conflicts. Displayed in public locations such as post offices, train stations, city halls and businesses, war posters and the messages they communicated were ubiquitous throughout the United States during both World Wars. 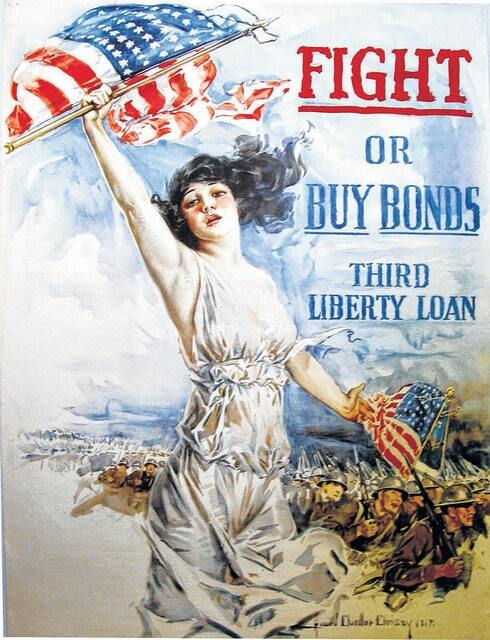 The posters explored themes of recruitment into the armed services; funding of the wars through bonds and other methods; home-front efforts which contributed to victory such as conservation and work ethic; campaigns by service organizations such as the Salvation Army, YMCA and Boy Scouts; and the role of women in the war effort. Many of the posters featured in the exhibition are American, with additional examples from Canada, France, Great Britain and other allied nations. The Dayton Art Institute has also partnered with the National Museum of the U.S. Air Force to borrow objects to supplement the exhibition, including an original Howard Chandler Christy painting, World War I squadron insignias (including one from Captain Eddie Rickenbacker’s Nieuport 28 airplane), trench art made by POWs during World War II, an infantry helmet worn by the Wright brothers’ nephew during World War I, and other items. In addition, uniform items from the Dayton Chapter of the American Red Cross, as well as other original items, such as signed photographs of five-star generals and war bond books with local connections, among other items, are included in the exhibition. Over the course of two years and five trips to Europe, Stevens photographed World War I monuments, cemeteries and battlegrounds. Nearly 20 large-format prints highlight Stevens’ interests in the visible manifestations of grief, memory and memorialization. Her reverential imagery employs both visual elegance and restraint as she pays homage to the loss and yet, at the same time, finds beauty in her representation of these hallowed grounds. Admission to “Call to Duty” and “Tears of Stone” is free for museum members; $14 adults; $11 seniors 60 and older, students 18 and older with ID, active military and groups 10 or more; $6 youth 7-17; and free for children 6 and under. Prices include admission to both special exhibitions and the museum’s permanent collection. Tickets are available by phone at 937-223-4278, or online at www.daytonartinstitute.org.